CdTe thin films are deposited on indium tin oxide (ITO) coated glass substrates by co-electrochemical deposition method. CdTe films are deposited at six different deposition potentials such as − 0.4, − 0.5, − 0.6, − 0.7, − 0.8 and − 0.9 V versus Ag/AgCl reference electrode. Deposition time is kept constant for 2 min. Deposition electrolyte includes aqueous solutions of 10 mM CdCl2, 20 mM Na2TeO3 as precursors, and 200 mM LiCl. HCl is used for pH adjustment of the electrolyte. 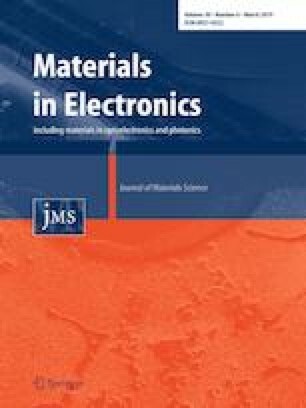 The effect of deposition potential on the characteristics of CdTe thin films is investigated by means of some techniques such as scanning electron microscopy (SEM), energy dispersive X-rays analysis (EDX), X-ray diffraction (XRD), Ultraviolet–Visible (UV–Vis) spectroscopy, Mott-Schottky measurements, and electrochemical impedance spectroscopy (EIS). Deposition potential dependency of the film surfaces is seen to be high from the SEM studies. EDX results show that Cd/Te ratios vary between 0.81 and 1.09. XRD analyses show that the films include hexagonal phase of CdTe and Cd1.81Te, and monoclinic phase of CdTe2O5. The optical band gaps (Eg) of all the films are derived from Tauc’s relation using absorbance data. Eg values change between 1.54 and 1.92 eV depending on the deposition voltage. Donor density of the n-type CdTe thin films deposited in the potential range between − 0.4 and − 0.8 V changes between ~ 1017 and ~ 1019 cm−3, while acceptor density is ~ 1020 cm−3 for only one p-type CdTe thin film with a deposition potential of − 0.9 V. Electronic energy band structure of the synthesized CdTe thin films are also studied in detail. From the equivalent electronic circuit fitted to the EIS data, electronic charge transfer in the CdTe/electrolyte system is determined to be the biggest for the CdTe film deposited at − 0.5 V.
This work was supported by the Research Fund of the Uludag University, Project Number KUAP(F)–2015/63. The authors thank to Uludag University for financial support.